The Meat For Every Occasion… except for perhaps Bar Mitzvahs. 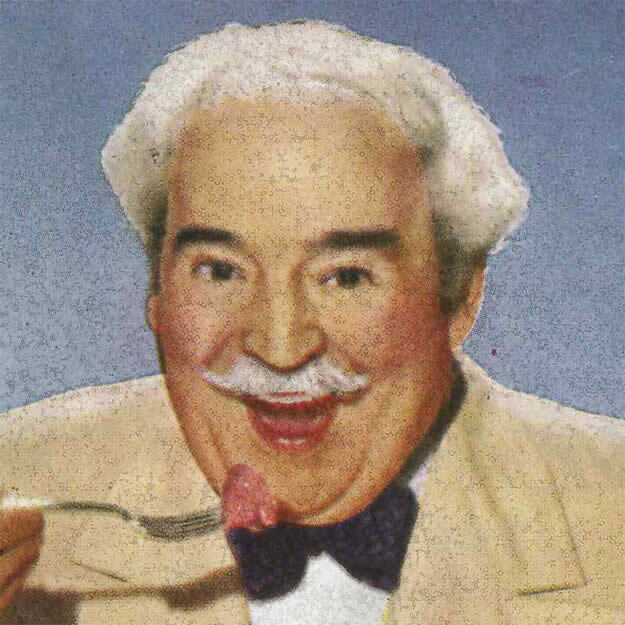 Uncle George likes his meat solid. Hormel’s SPAM is infamously “spiced ham”. Armour’s Treet is a “spiced luncheon loaf”. Wilson & Co.’s MOR was described as “no bone”, “no gristle” and “solid”. Can’t imagine why they’re not still around. I wonder if Wilson & Co. was related to Wilsons Leather? Would make sense. Strangely, a Google search indicates that Wilson & Company is now an engineering/architectural firm. Perfect if their mission is to build a better sandwich. Design note: Upon viewing the ad, you’ll notice that during World War II, they must’ve rationed ad margins along with food. MOR Meat FOR YOUR PRECIOUS POINTS! In each can of delicious MOR there is enough solid, satisfying meat for four hungry people. Hot or cold, it’s a grand meat, with the good taste, energy value, and Vitamin B1 of tender pork morsels delightfully seasoned. With four hearty servings, or 12 to 16 slices to the can, MOR is a real meat bargain in price and in points. Serve this time-saving, money-saving and stamp-saving meat often. Fry it, broil it or bake it…for breakfast, lunch or dinner. And use it for husky, satisfying sandwiches in worker’s lunch boxes. NOTE:—A big share of our production of MOR is being enjoyed by our fighting forces and allies. If you can’t get MOR each time you ask for it don’t give us. Keep on asking for it every time you go to market. It’s a delectable combination of one can Mor, diced, 4 cups leftover vegetables (use a variety), grated onion, and 3 cups of rich gravy, topped with pinwheels of pastry or biscuit dough and baked. Serves 6 generously. Nutritious and economical too. (If you have no grave, use Wilson’s B-V, adding 1 tsp. B-V to each cup vegetable water or milk). The Wilson label protects your table. This entry was posted in ads of yore and tagged 1940s, 40s, ads, advertisements, advertising, advertising history, fourties, magazine ads, MOR, print ads, spam, treet, vintage, vintage ads, vintage advertisements, vintage advertising, wilson & co., world war two, wwii on February 5, 2017 by Clayton Hove.